Digital Marketing Company SEO it Right Ltd are celebrating five years in business this month. We’ve invested our time and money into developing in-house marketing, copywriting and developer skills to meet the needs of the modern small business. 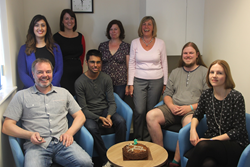 Digital Marketing Company SEO it Right Ltd are celebrating five years in business this month. The Four Oaks based company were incorporated in Spring 2010 as Search Engine Optimisation specialists. They have since grown into a digital marketing agency, helping companies throughout the UK to reach and engage with their target audiences online. In the five years since the company was set up by Directors Adam and Frances Berry, SEO it Right Ltd has developed from a home-based business to a thriving company, employing eight members of staff and with an annual turnover of £300,000. As well as working with local businesses, some of whom have been with the company since its inception, SEO it Right offer content marketing, PR, social media solutions and paid advertising to small businesses throughout the UK. “When we set up SEO it Right we were helping small businesses to develop their presence in organic search. In the five years since, the internet and mobile device use has exploded, making our industry a challenging and very exciting one. We’ve invested our time and money into developing in-house marketing, copywriting and developer skills to meet the needs of the modern small business. So whether they need to engage with potential customers on social media, appear prominently in search or simply generate more brand awareness, our team can help. In addition to their Sutton Coldfield offices, SEO it Right also have a sister company servicing customers in the South of England. Further information on SEO it Right, and the services they provide can be found by visiting their website seo-it-right.co.uk.